January 2017 – Our stay in Bangkok, Thailand, was filled with exotic sights and sounds, and at the Damnoen Saduak Floating Market we got a peek at a way of life that had been uniquely Thai back in the days when the city was built on canals. 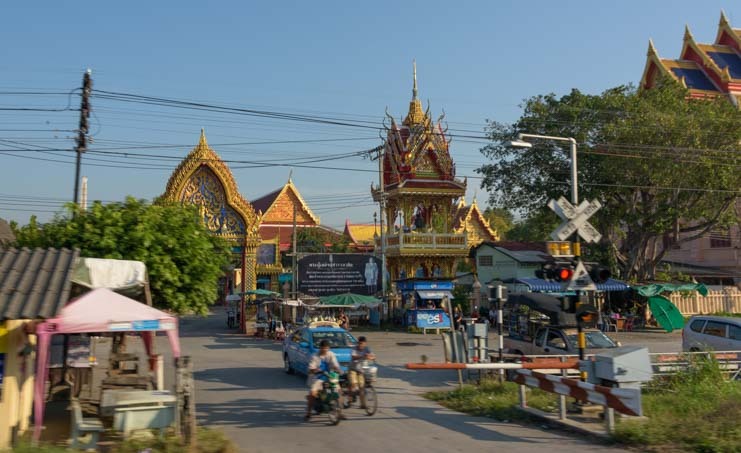 But it was a train trip from Bangkok to Kanchanaburi, about 75 miles west of the city, that made us feel like we were beginning to see the “real” Thailand. 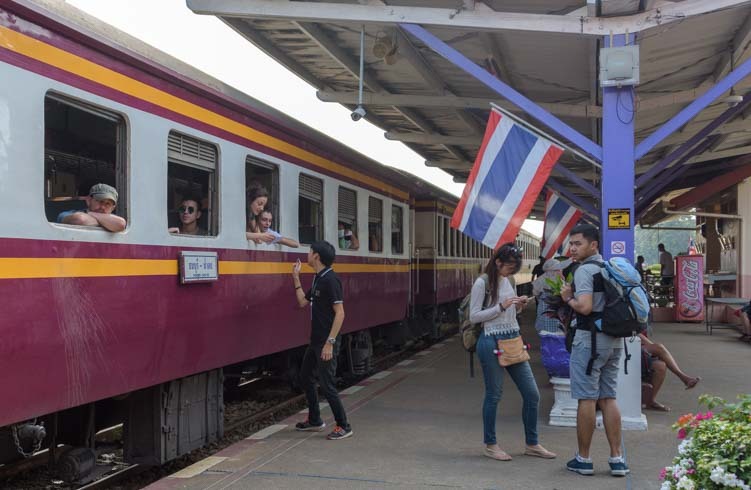 The train from Bangkok to Kanchanaburi is a 3rd class train that leaves from the Thonburi station in Bangkok. The station and the streets around it were absolutely teaming with people, as it sits alongside a huge market where anything and everything was for sale on a vast array of tables and carts. Tickets for the three hour train trip were just 100 Baht each, about $2.85 US, but we’d made the mistake of showing up without any notes worth less than 500 Baht. To our surprise, the ticket booth at the train station wouldn’t accept a 500 Baht note for 200 Baht worth of tickets. So, I ran off through the market, passed by an ATM that was out of order, and finally found a lady selling juice from a cart who had an apron filled with bills of all denominations. Fortunately, she understood enough English and sign language that when I waved a 500 Baht note at her she figured out what I wanted. In no time I was back at the train station ticket window with exact change. Phew! 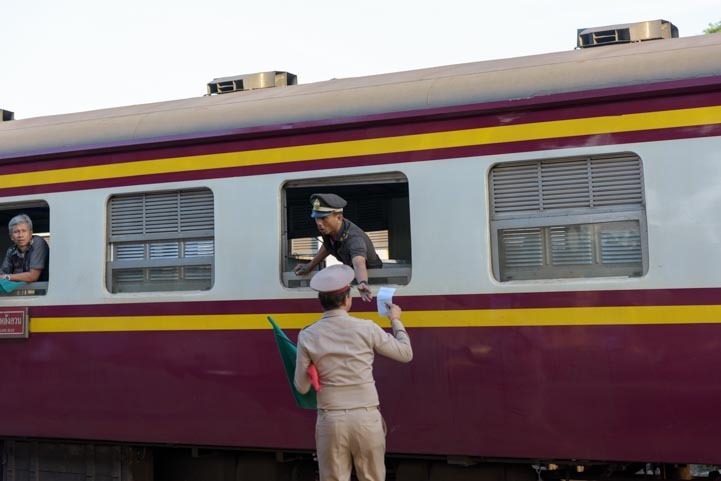 A train conductor and a station guard exchange paperwork through the train window. 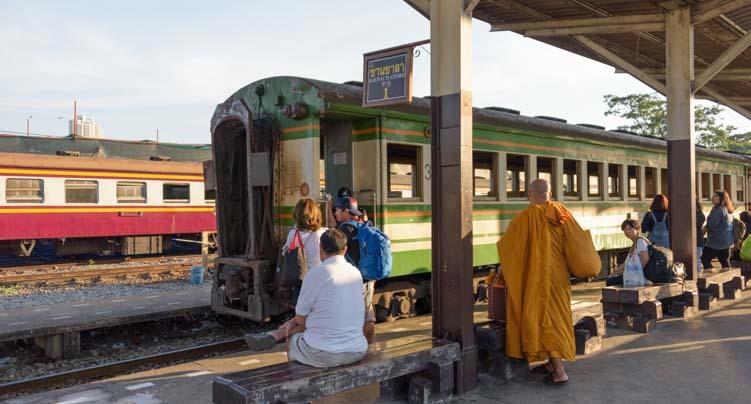 There were quite a few “farangs” (foreigners) waiting for this train, as it is a popular trip for tourists to do. But all the other trains at the station were loading and unloading throngs of locals who were going about their daily business. 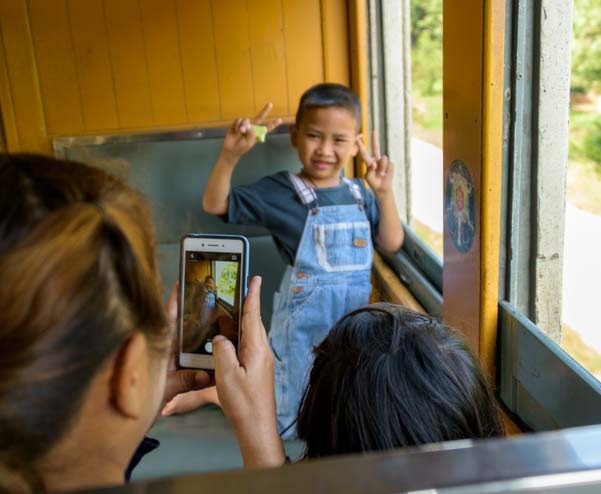 The Kanchanaburi train finally arrived, and we hopped on board. We hadn’t been sure what “3rd class” would mean, but it turned out to be just like the commuter rail trains I used to ride as a kid years ago, except the windows were all wide open. The train from Bangkok to Kanchanaburi is “3rd class” but we found it clean and comfortable. 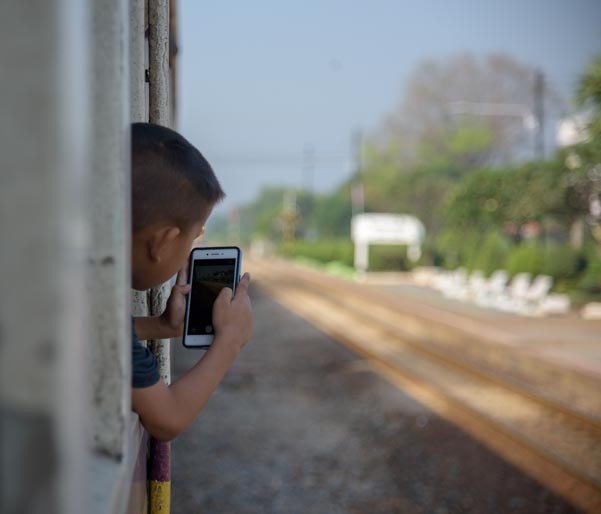 As we headed out of Bangkok, the train narrowly missed hitting the corrugated metal rooftops of endless rows of houses, and we got a peek at the backside of Bangkok, as is so common when you take a train somewhere. We saw what amounted to being the “other side of the tracks” in some very poor neighborhoods. 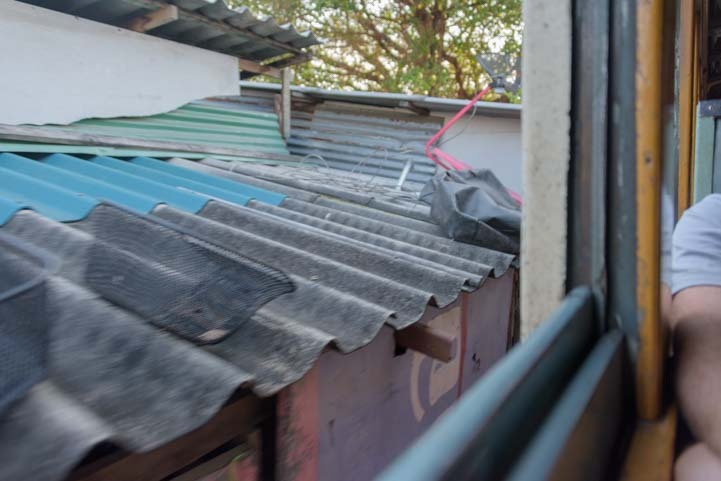 The train skims past corrugated metal rooftops in Bangkok. Once we got out of town a ways, we began to see classic Asian sights out the windows. We stopped at quite a few train stations along the way. 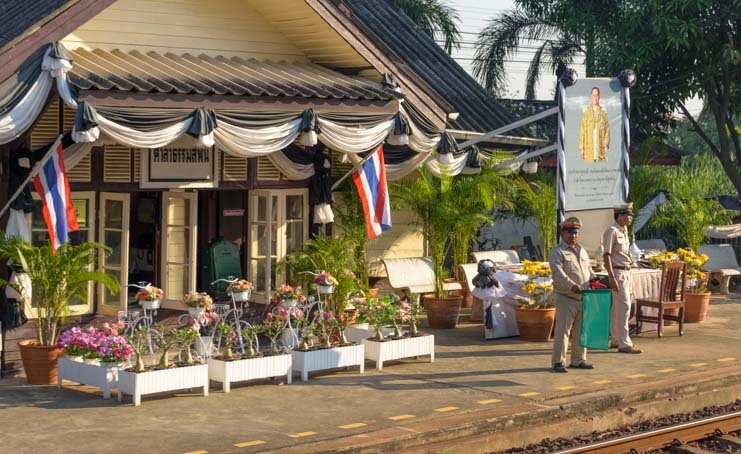 Several stations were very ornate with uniformed guards standing watch, and most were decorated with memorials to the beloved deceased Thai King Bhumibol Adulyadej who had died in October, 2016. 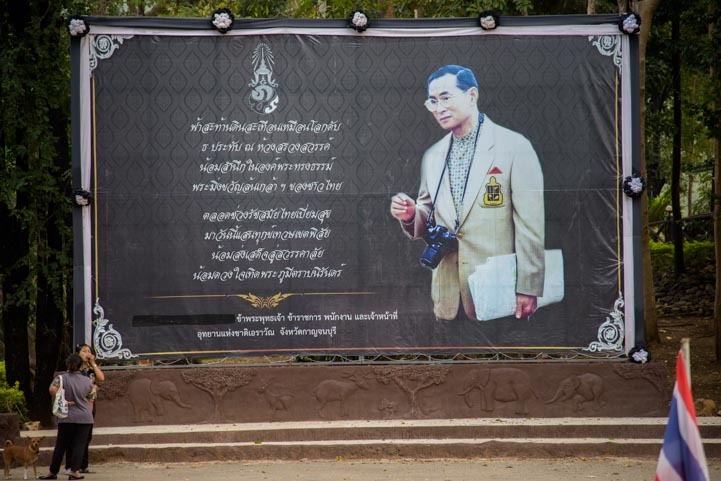 During our stay in Thailand we saw thousands of memorials to the king, often with photos of him either as a young man who appeared to be very studious, or as a middle aged man dressed in all his royal splendor and regalia. 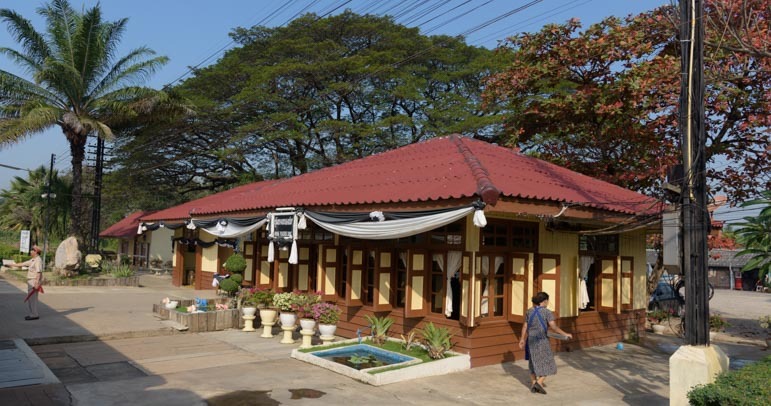 A train station decorated with the black and white ribbons memorializing the recently deceased King of Thailand. In general, when we walked on the streets, we couldn’t go 50 yards without encountering a memorial of some kind, and in a car or on this train the billboards and roadside shrines appeared several times per mile. Memorials to King Bhumibol Adulyadej were everywhere in Thailand. After about an hour, we stopped at one train stop and a group of vendors got on board. They walked up and down the aisle selling foods of various kinds. A food vendor offers munchies to travelers on the train. Each vendor took a turn in each train car, waiting for the vendor ahead of them to finish walking through the car before strolling down the aisle themselves. 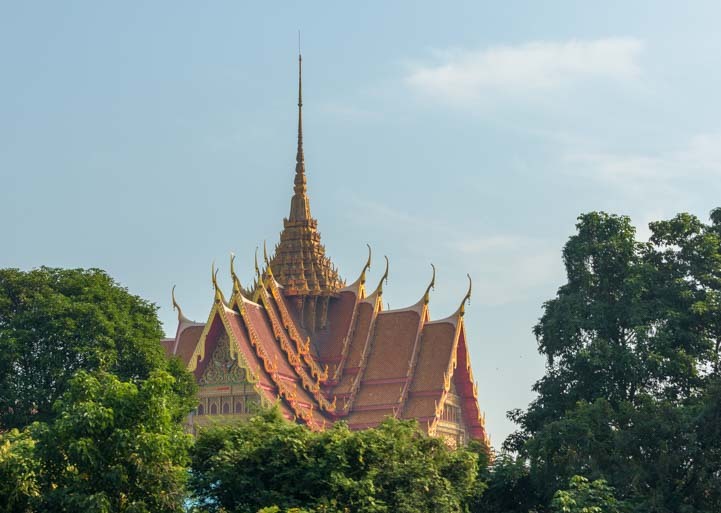 Meanwhile, out the window, the ornate rooftops of temples and other buildings appeared between the trees. In the seat in front of us, a little boy was as fascinated with what he saw out the train window as we were. The things we were passing were fascinating, and not just to us! His sister hung her head out the window too, and we got such a kick out of watching these two adorable kids taking in all the scenery and pointing and commenting on it. They were loving the train ride as much as we were. Their mom let them take shots out the window with her cell phone and then she got some pics of the two of them. We couldn’t help but take photos of them too! 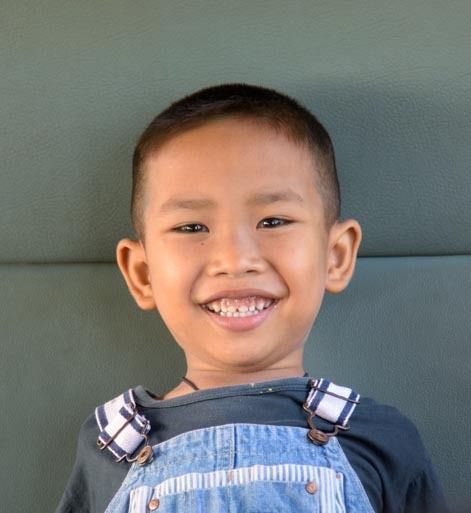 After a while, the little boy peeked over the top of the seatback at me, put his hands together and bowed his head in the Thai expression of respect. I was touched and told his mom her children were very beautiful and she gave me a huge smile. These kids were so adorable we got pics and so did their mom! She and I tried to tell each other where we were heading, though, and our attempt at conversation was hopeless. I think she said they were going to the mountains, and I tried to tell her we were going to see some waterfalls. But sign language and giggles only go so far. 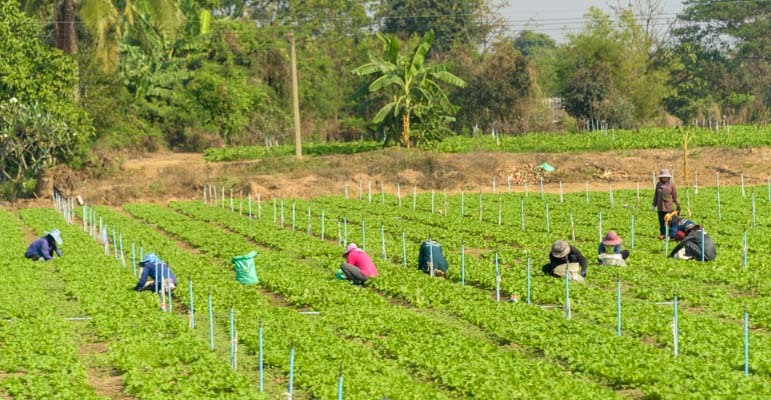 The train ride took us out into the countryside, far from the chaos of Bangkok, and soon we began to see the rural sights of farms and farmers tending their fields. Some of the farmers were tilling the land by hand. We passed lots of farm fields and farmers working. We passed a row of trees that was so perfectly lined up I just had to take a photo. 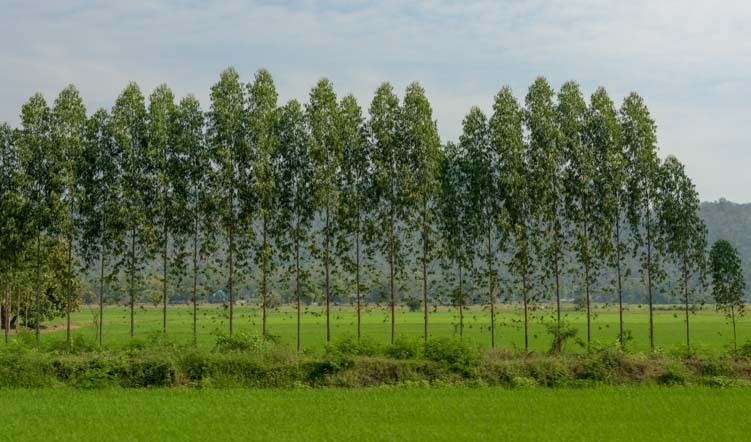 I didn’t realize at the time that these trees were rubber trees. A few days later I would see these trees up close, each one holding a small mug-sized cup to catch the sap. We also passed a cemetery filled with pointed shrines for deceased loved ones. We caught a brief glimpse of a cemetery with lots of tombstones. In no time, the trip was over. 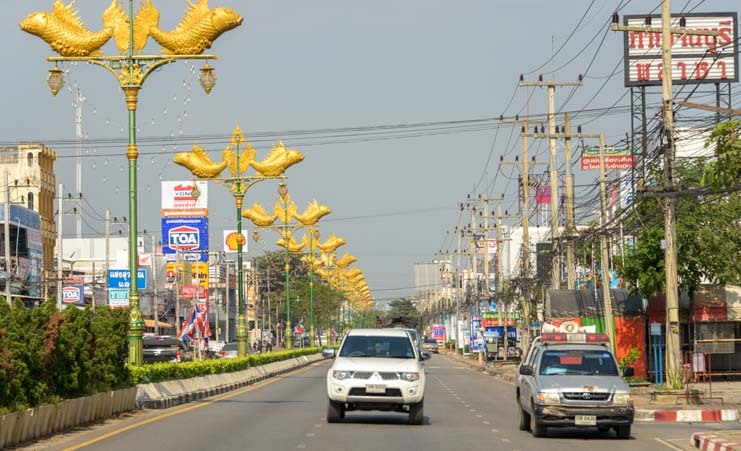 The three hours had zipped by, and we had arrived in Kanchanaburi. An agent came to the train and greeted all the foreigners as we got off the train. She asked each of us where we were staying and assigned us to a cab or tuk-tuk to get us there. We were staying at the Bure Homestay which is just a few kilometers from the train station. Peering out the window of the cab, the town of Kanchanaburi seemed very inviting. 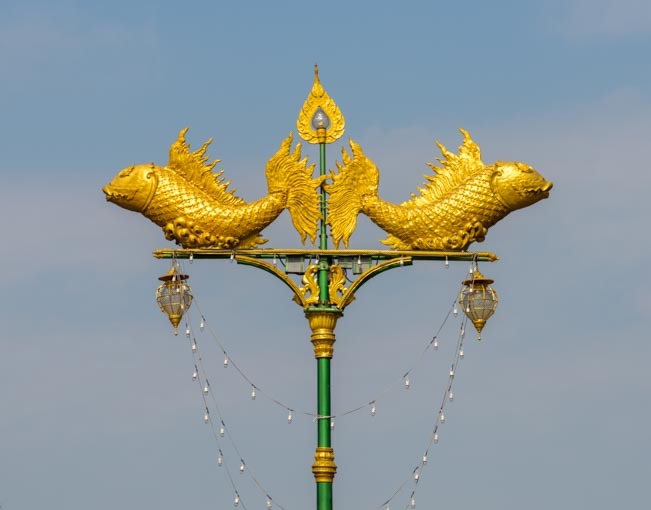 We loved the fish that adorned the tops of all the streetlights. As we wandered around the town we noticed some very cool buses that were two stories tall and were painted up in wild colors and said “Mr. Beer” on the side. 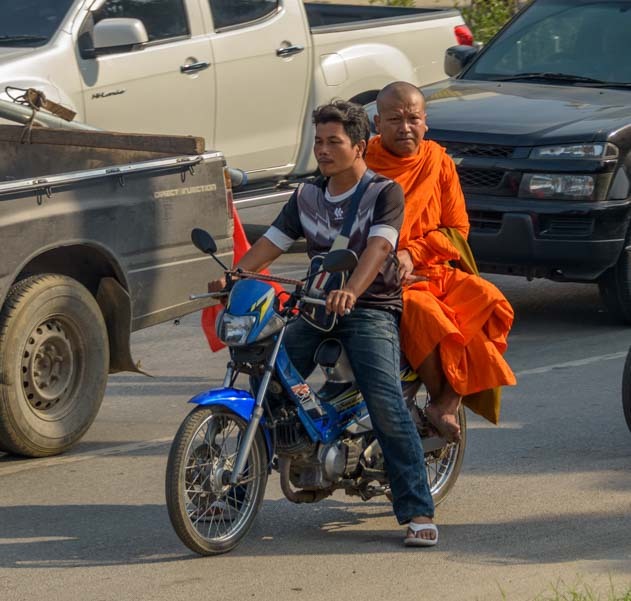 There are many ways to travel in Thailand!! We poked our heads inside one of these buses and were amazed to find that the entire first floor of the bus was a bar! The two bar tenders greeted us warmly, although they seemed to be a few sheets to the wind themselves, and we got a chuckle as we realized there are many ways to get around Thailand. 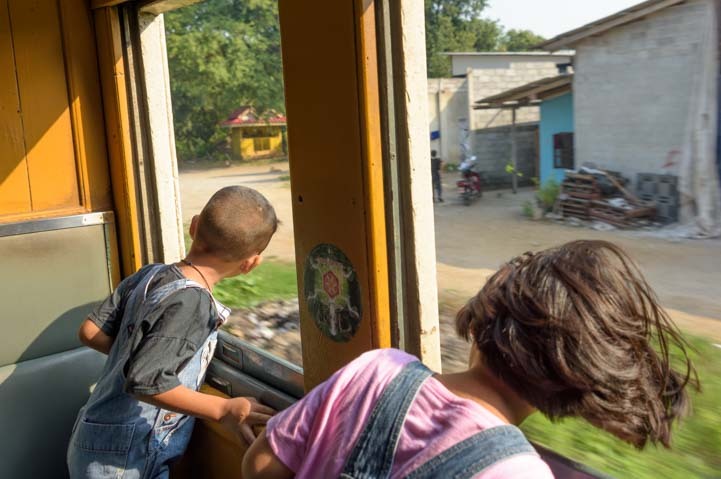 For us, the 3rd class train from Bangkok to Kanchanaburi was a great way to go, and it felt very authentic and made for a very pleasant three hour ride. Welcome to the Mr. Beer Bus! But taking the Mr. Beer bus could always be another option! 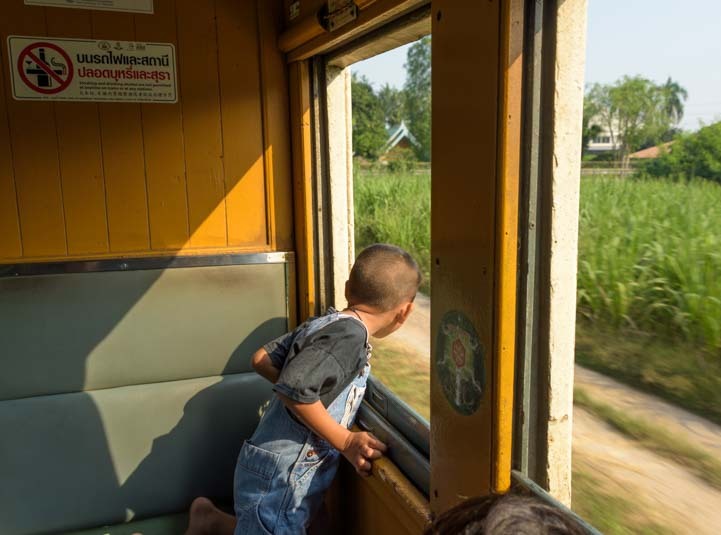 Take small bills of 100 Baht and 200 Baht to the train station window to buy your ticket! This entry was posted in Thailand and tagged New, Thailand, Thailand Travel, Travel, WP Travel by Roads Less Traveled. Bookmark the permalink. Cheers from a chilly Maine! Hey Pete – It’s been a fascinating and wild ride over here in Thailand and it has been really fun to mix it up and experience something completely different. We’ve left our rig for long periods of time while traveling abroad quite a bit over the years. The whole time we cruised in Mexico, nearly 4 years, we left our rig in covered storage, returning to it each summer to travel for a while and then putting it back to bed and returning to Mexico to sail some more. The longest we left it was for 20 months at the beginning of our cruise, and during that time we let both the truck and trailer insurance lapse when it came due to pay for another year. We figured that other than the storage facility having a fire or explosion, the chance of something happening to the rig was minimal. Sure enough, each time we returned, it was fine. However, in our final 14 straight months of cruising, the storage facility manager forgot to plug in the rig for its usual monthly recharge and the batteries in both the truck and trailer were shot when we came home. This time around we left the rig in a repair facility in Mesa, Arizona, to get some things taken care of. They have a storage yard, so they said they would just keep it in the storage area when they were weren’t working on it. Frankly, we hadn’t even looked at our insurance policy’s storage coverage and just figured it was safe with the repair guys at their shop behind their locked and alarmed gate. 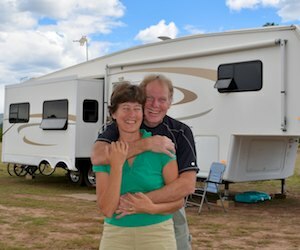 One of the beauties of living in an RV is that it doesn’t take much to wrap it up and leave it behind for a few months. Stay warm up there in Maine… it is HOT HOT HOT on the beach here in Thailand!!! What a great experience! Traveling on the local transportation is a great way to see what the area is like. It’s interesting the vendors on the train waited for the other to leave the car before entering. I’m assuming it was out of respect. How is the traffic in the areas you have been in? Is it orderly or a mad dash? 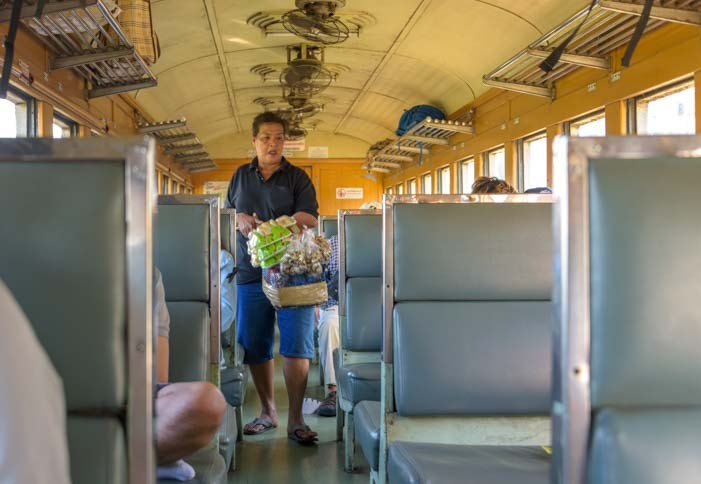 There is a lot of respect given and received in Thailand, it seems, and the vendors were definitely giving each other a chance to take their time with potential customers in each train car. We’ve seen some wild driving, because the roads are filled with cars, trucks, tuk-tuks and motorbikes going at different speeds. Faster vehicles frequently overtake slower ones, and they often do it without worrying about whether there is oncoming traffic, as everyone just tries to squeeze in. It seems even worse at times because they drive on the other side of the road which is disorienting! I lived in Thailand as a teenager in the 70’s (dad was US military) so am enjoying the sights down memory lane. Thanks and enjoy! What a neat experience that must have been. I imagine Thailand has changed very dramatically in many ways since the 70’s, but the flavor is probably still much the same. …the multi-turreted buildings are fascnating…as is the publc devotion to the beloved king. 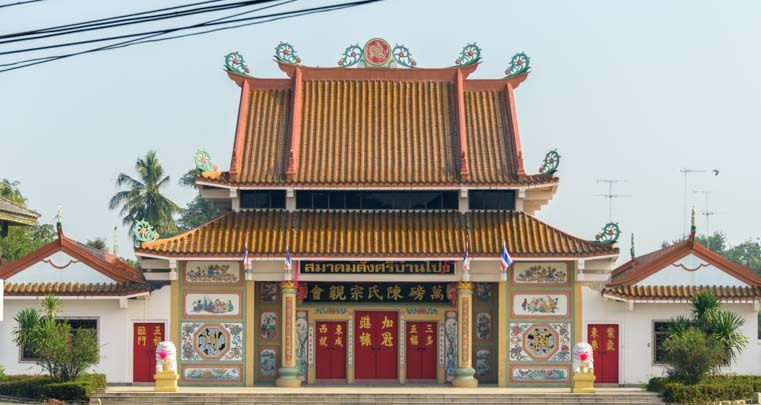 Did you see the interior, catch any ceremonies or hear any authentic music in these beautful temples ? We haven’t been inside the temples yet. There is a dress code for covered knees and elbows when entering temples, and it is so hot we haven’t yet been dressed quite right for temple viewing. But we have some time to go and some special buildings we want to see. Wow, some really beautiful photos….again! Looks like you guys are really seeing the sights and having some fun. It has been a great trip with lots of variety and plenty of adventures, Pete. We’re very fortunate to have been able to come here and get our cameras humming!! Having worked and vacationed many times in Thailand, I’m enjoying your posts immensely. I love how you tell a story with your photos…nicely done. 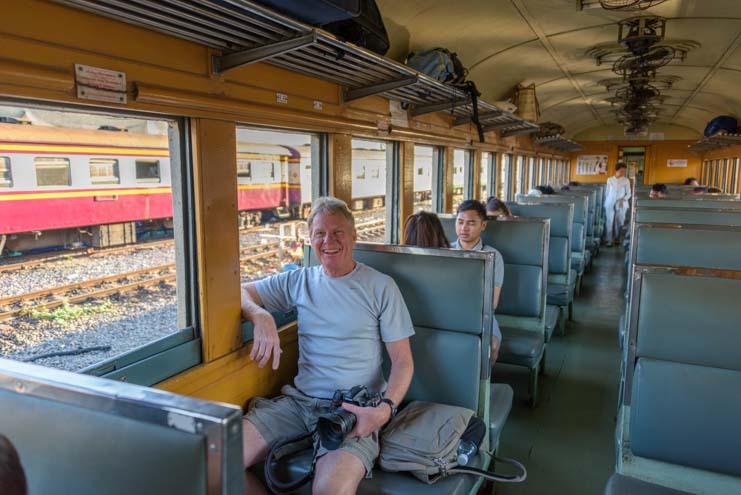 If you have time, try the overnight train from Bangkok to Changmai, and be sure to visit the dining car just behind the engine for breakfast in the final hour of the trip…that is an experience to remember. Also, the south of Thailand is lovely…Krabi province and Ao Nang in particular are my favorite…which gives you good access to the Phi Phi Islands without fighting the crowds in Phuket. Enjoy your remaining time in the Land of Smiles! I’m so glad to hear you are enjoying these posts, Eric, and that they are bringing back good memories for you. We have had a wonderful time in Thailand and I just came in from a sunrise walk on the beach in Ko Lanta! 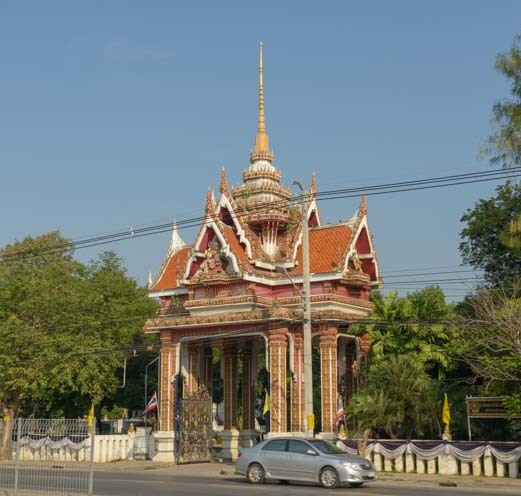 We didn’t get to Chang Mai on this trip, but will definitely go there another time. I had thought we’d fly, but you make the train ride sound really worthwhile! Thanks for posting! The photos are wonderful…. those buildings are really fun to look at. I’m looking forward to more posts. It’s an interesting country, Liz, and we’ve seen all kinds of special things — lots more to come!! Enjoy your posts immensely. Just curious what crops the farmers are attending. I assume rice is one but the pics look like different things than that. When is the rainy season…weather looks great so far. Continue having a great time. 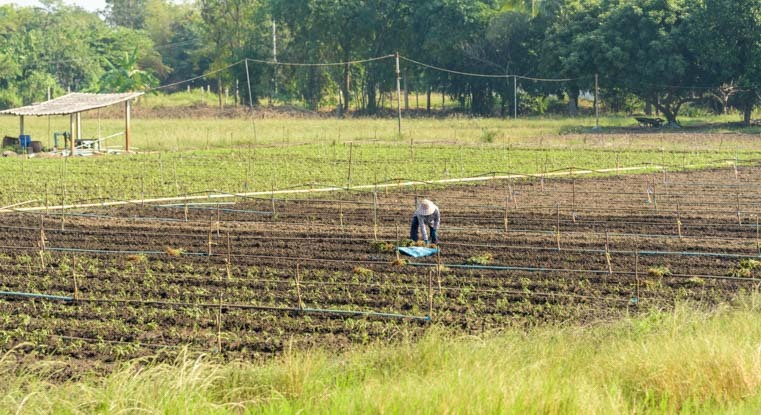 I have no idea which specific crops were being tended in these photos, but we heard that soy, sugar cane and corn are common, as are tropical fruits and rubber from rubber trees. 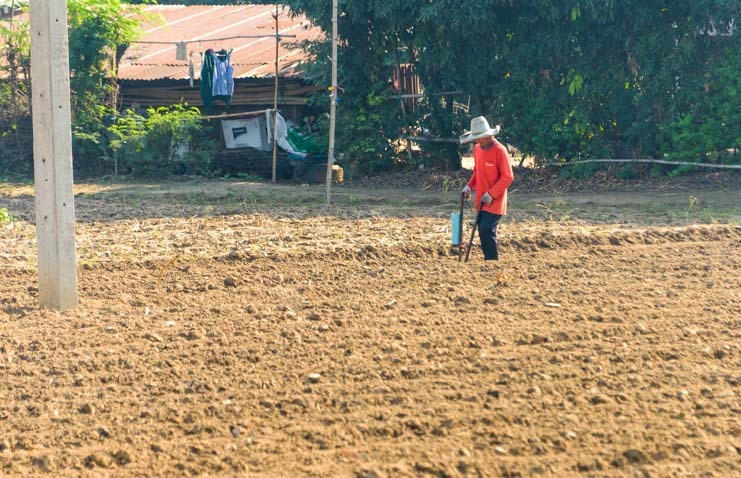 The rainy season is September to November, but it seemed to last into January this year with huge rains and massive flooding in southern Thailand in early January.